WARNING: The following may cause your computer monitors to heat up. Make sure you are seated and have close access to a telephone by which you can contact emergency services should you need it. This photo is HOT! 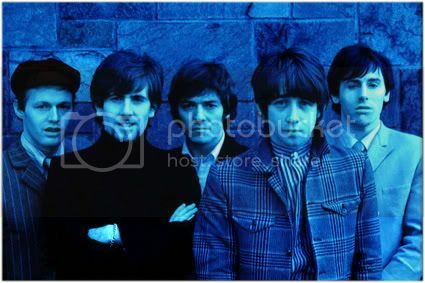 Now that you have read the preceding, please scroll down to view one of the most breathtaking photos of the Hollies that has ever been taken. WOW, it's just Hollie Heaven on the forum at the minute .I've never seen this pic before and it is stunning!!!!!!! It's also helpful as I'm decorating at the moment and that jacket of Allan's reminds me that I must buy some wallpaper for my bedroom .Thanks Queenie. Wow this is one hollies pic I've not seen before clarkey is gorgeous as usual even with that wallpaper hes wearing I love the look of Tony here hes giving allan a run of his money in the looks department here and the other lads aren't too bad either thanks for this Vrinda! HUBBA! HUBBA! Thanks Kat. 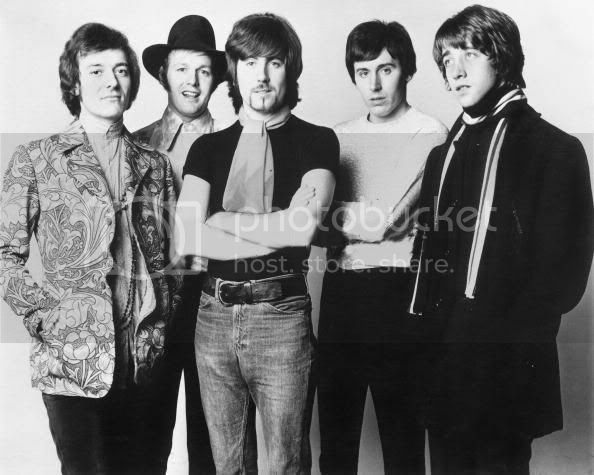 This Hollies pic is such a fav of mine. That look on Allan's face just knocks me sideways. "Here I go again" the floor is fast approaching,arh!!!!!!!!!!!!!!!! Whoa! Wait up, Paula! You've got company. I'm "Heading for a Fall" after seeing this! Allan gets me each time! That man has some strange, but enchanting, effect on me. LOL! I never noticed that! Allan's jacket does look wallpaper. In fact, it looks like a bedspread my mom once had - flowers and all. If you look closely, you'll notice that he's wearing a long, beaded necklace. Only gorgeous Allan could get away with that! Thanks for the lovely picture, Vrinda! I definitely think that Tony is the most good looking, or at least cutest, one of them all here. And Kat, thanks for posting the beautiful blue picture! Almost like the one on For Certain Because, but not quite. Thank goodness, Agneta! Finally, a calm voice of reason. Are you saying that I'm not a calm voice of reason when it comes to Allan Clarke? What moi !!!!!!!!!!! Apart from having heart palpitations, drooling, falling about the place, laughing uncontrollably, crying uncontrollably and generally being in a tiz, Mr. Clarke has absolutely no effect whatsoever on me . Haha you bet your life! Paula, get yourself some Tylenol Extra Strength! You're going to need it for that headache you'll get once your head hits the floor! Here is another of my favorites. It was taken in 1964. The boys are so cute here, as always. 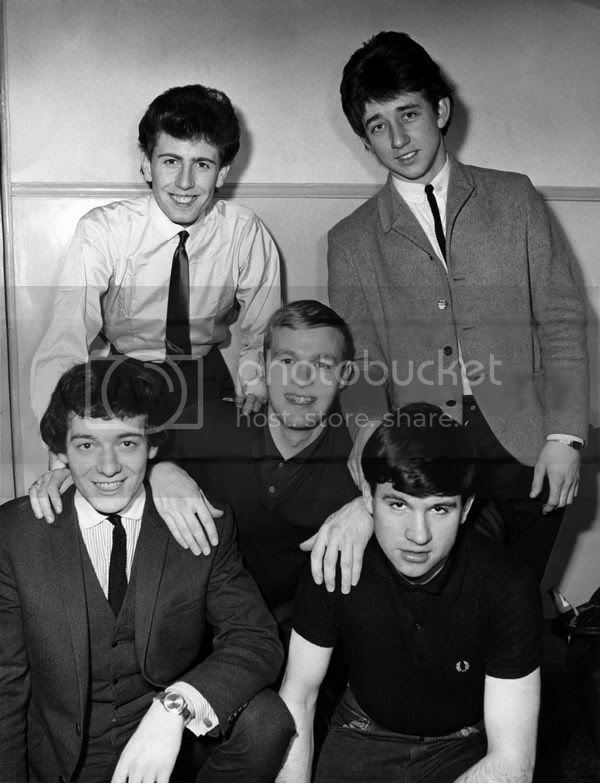 Look at how Graham has his hand on Allan's and Bobby's shoulders, and Tony's got his hand on Bobby's. I just love it when they get so close like that! Allan, Graham, and Bobby have the most angelic smiles I've ever seen, and Tony and Eric are just adorable! Ah!!!!!!!!! look at these lovely little cherubs. How could we not get all mushy about this beautiful pic on a day like today. Thanks so much for this ,Queenie. I'm sure that you'll join me girls in wishing all the Hollies, past and present a VERY HAPPY AND ROMANTIC VALENTINE'S DAY. IF I could I'd put myself in a big( I mean huge) envelope and send myself to Allan . But the postage and packing would be astronomical .